The topic for the penultimate week in the E-Learning 3.0 MOOC is ‘Experience’. We haven’t really started discussing this yet, but Stephen Downes, who is running this course, has posted a Synopsis to get us going. I am copying this below, with some initial thoughts/responses/questions inserted into his text in blue font. Stephen’s text is in italics. “It is a truism that we learn from experience, and yet creating a role for experience in learning has been one of the most difficult problems in education. When I think of experience in relation to learning the first thing that comes to mind is ‘field trips’. One my earliest strong memories is of a week-long field trip to Seahouses (Northumberland, UK) for my ‘A’ level Biology course. The week was spent gathering data on the beach and then recording it in a whole variety of ways in the evenings. I have had many such experiences in my ‘learning life’. My understanding of why these experiences are important and different is that they are ‘embodied’ and elicit an emotional response to a given topic. A photo of a Water Boatman on a pond-life chart might help you to recognise it, but won’t have the same impact as actually lifting one from the pond in your net, so that you can study it live under the microscope (in pond water of course!). My experience is that educators have to believe in the value of hands-on experience for it to be included in a curriculum. But it is also a truism that we don’t always learn from experience. Some learners can make the same mistakes over and over again. And so much of education continues to rely on indirect methods depending on knowledge transfer – reading, lectures, videos – rather than hands-on practice and knowledge creation. This is true and I think stems from a belief that it is the ‘content to be covered’ that is important and there is ever more content; therefore time is short. Hands-on experience, for example field trips, take time. Just last week a friend was running a management game for a group of MSc students. The game takes a week to complete. Students are required to work in teams to solve simulated ‘real-world’ problems. In previous years the students have described this game as the most valuable learning experience of their course, but next year the game will be cut from the course. There is no time! The emergence of the web, YouTube, Web 2.0 and social media was a great step forward, assigning a role for creativity in the learning experience. But experience, ultimately, requires an openness that media platforms were unable to provide. The importance of creativity has long been recognised and the loss of emphasis on this in the curriculum (here in the UK) has long been a subject of concern. I remember in 1999 how stimulating it was to go to a conference on the newly published report – All Our Futures: Creativity, Culture and Education. Ken Robinson who chaired the publication of this document has been pushing for more creativity in the curriculum ever since. But there is increasing evidence that creativity in the curriculum is being squeezed out. 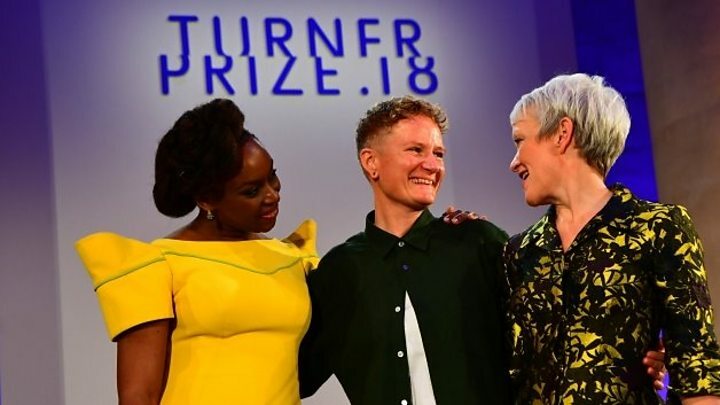 This theme was taken up by author Chimamanda Ngozi Adichie when she awarded this year’s Turner Prize to Charlotte Prodger. The lack of creativity in the curriculum remains a concern. New technology is beginning to combine the ability of teachers and role models to model and demonstrate successful practice and the need for learners to practice and reflect on their learning in that environment. Content distribution networks and live streaming are transforming real-world events into hands-on learning experiences. This is a course about the distributed web and so, of course, we are thinking about how the distributed web can promote hands-on learning experience. Hopefully this will not be confined to experiences through our screens, but will also promote experience of the real live world, as opposed to the virtual world. A good example of this is the live-streaming platform Twitch and especially games like Fortnight, in which players become spectators, and back again, over and over. And using applications like xSplit or Open Broadcaster Software individuals can make their experiences part of the learning experience shared by others. I have never played computer games, so I don’t know how individuals make their experience part of the learning experience shared by others works in these contexts. What would be the equivalent off the internet? It is a model in which the creation of the content becomes a part of the content itself. I interpret this to mean sharing the working processes that lead to content. We see this with the recent self-shredding art by Banksy or the inside look at how the single-scene time-lapse sequence in Kidding was filmed. Some artists have made working openly part of the act – Deadmau5, for example, showing how electronic music is produced. Being able to see and experience how something is created is a key step on the way to becoming a creator oneself, and becoming a creator, in turn, becomes a key part of the learning experience. Isn’t this what mathematicians, for example, have always done? Even small children in schools are encouraged to show their ‘workings’ – how they have arrived at a result. And artists frequently do this with their sketchbooks, but the difference is explained by Stephen below. We now have the possibility of creative activities becoming distributed and democratized. This has reminded me of Eric Whitacre’s Virtual Choir, but I don’t think this is quite what Stephen has in mind. Whilst the choir is distributed it is not democratized, in the sense that each singer cannot edit the final piece, but can only contribute to it. The difference between previous iterations of learning technology and that which we are experiencing with E-Learning 3.0 is that these creative activities become distributed and democratized. Just as multiple authors can edit Wikipedia articles or work on code in GitHub, participatory learning media enables learners to interact creatively without management or direction; the outcome is a consensus determined not by voting but by participation. Experience in learning changes the relation between teacher and student from one of persuasion (and even coercion) to one of creativity, co-work, and construction. I’m wondering what effect this will have on an individual’s creative ability. If we take painters, for example, there are very, very few artists who work collaboratively on a painting. Off the top of my head I can think of the Singh Twins and Gilbert and George. Most painters create their work individually, even if they employ teams of people to produce their ideas. How will the fine arts change if they become a result of consensus. What will happen to ‘genius’? Will consensus lead to a ‘dumbing down’ and loss of creativity, or to a different kind of creativity, or to increased creativity? And to what extent will this creativity be a result of embodied experience? What type of experience will it result from? These are just some initial thoughts at the start of this topic. Fascinating, Jennie. Thank you for sharing your thoughts. Thank you Doris. Good to hear from you again. If this topic interests you, you might be interested in the conversation that will take place on Saturday at noon between Stephen Downes and Amy Burvall. The link will be posted here – https://el30.mooc.ca/course_activity_centre.htm – and on Twitter #el30. Thanks for this. I’ll be revising the summary paper a bit to take some of these questions into account. One note: “very few artists who work collaboratively on a painting.” True. Just as for most of my papers I am the sole author. But here you are focusing on the product, rather than the history and creation of the product. My work (and Rembrandt’s) is created by a single author, but is the product of years of training and development, external circumstances, a community of artists or researchers, socially developed techniques ranging from perspective to style, etc. etc. Even the subject of the paintings – people, places, etc – is drawn from the community – is drawn from the consensus of the times, and his experience of that, as a participant in creating that. Thanks for your response Stephen. You make a good point about focussing on the product and on reflection I can see what an important point this is. I particularly appreciate the ideas you have expressed in your last paragraph. You have reminded me that our education system tends to value the products of individuals. A PhD is a classic example of this. As you know my PhD by publication resulted from a series of collaboratively authored papers. I had to quite fiercely defend this collaboration in my viva.